My home for the night was pretty amazing. 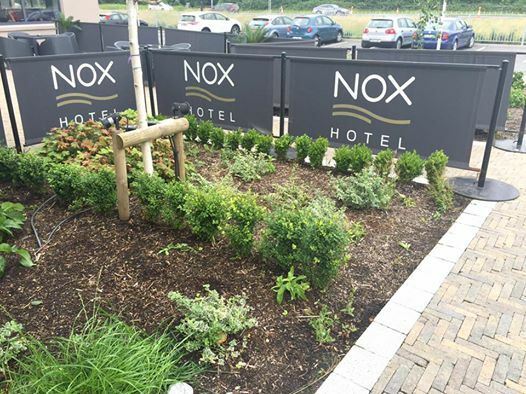 I spent one night in one of Galway's newest and most trendiest hotel's The Nox Hotel . 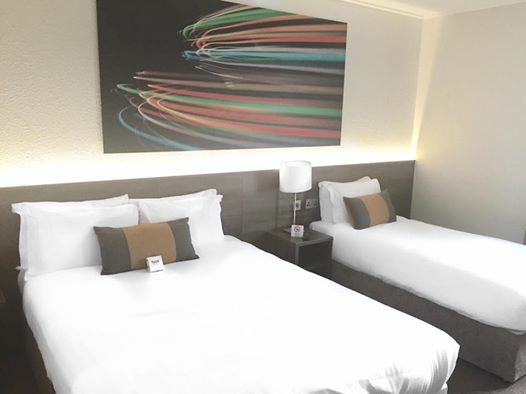 I stayed in a twin room with my friend who is also a fashion blogger, Shona from Sho Style. To say we were excited about the entire collaboration was an understatement. During the summer we had both attended a really cool event in the hotel so we had already experienced a piece of what the hotel had to offer but nothing in this world would have prepared us for what we were about to find out. From the moment I arrived to the hotel on Thursday evening there was such a buzz and happy atmosphere. It was the night before the announcement of who would be the European Capital Of Culture so there was such excitement throughout the city. The lobby of the hotel has such a relaxing vibe and is a great place to meet friends for coffee or cocktails. It is open plan, spacious and airy. 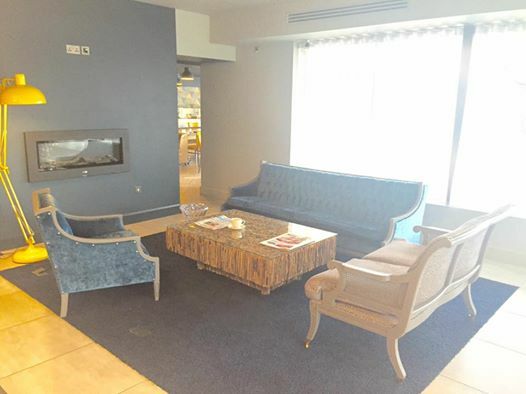 The seating areas are also organised really well, no matter how busy the hotel gets you wont feel like you are squashed into one little area or in anyone's way. There is also a beautiful seating area outside, the perfect location for a sunny day. We didn't realize just how big the hotel was until we made our way to our room. We were on the fourth floor, which again was spacious and airy. The hallways have dark grey decor but are lit with spotlights which gives a really glamorous feel. 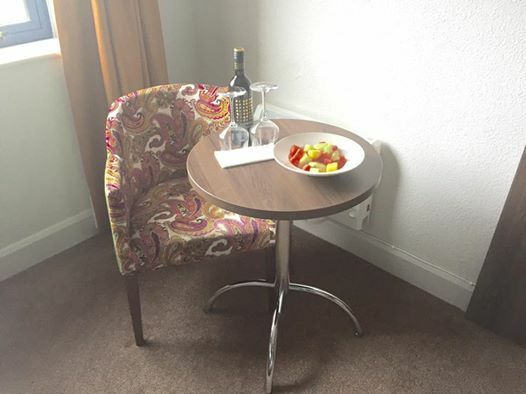 On arrival to our rooms we were greeted with a welcome pack which included a bottle of processo, a refreshing fruit salad, luxury chocolates and my favourite brand of water Fior Uisce. All of which we really appreciated. Our first impression of the room was just how clean it was. There was not one thing out of place and not a speck of dust to be found. 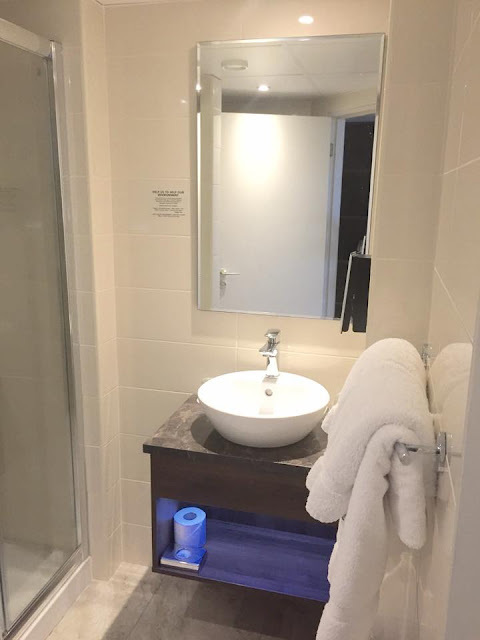 The entire hotel was also extremely clean and smelt so fresh. Our room was spacious and modern. There was a double bed and a single bed both dreamy, crisp and white, we just sank right into them. I can honestly say the comfiest hotel bed I have ever slept in. 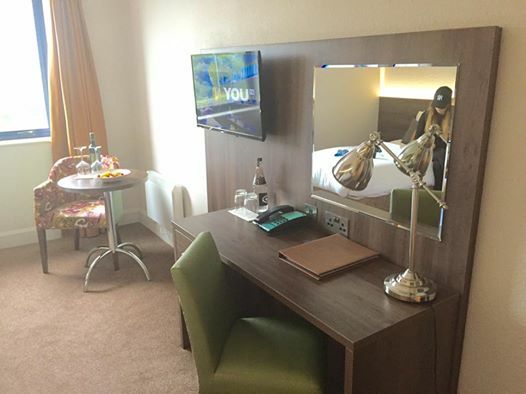 The room had a large window so it was lovely and bright, there was a wide screen TV on the wall, a vanity area to do your make up or to catch up on some emails, plenty of storage space and of course a full length selfie mirror. The bathroom was clean and chic. Filled with clean fluffy towels, hand wash, shampoo and conditioner. The shower was amazing. It was easy to use, set to the perfect temperature and had plenty of power. That evening we were feeling rather hungry so we decided to sample some bar food. The staff were extremely busy but still went out of there way to be kind and get us what ever we desired. I decided to have Caesar Salad. Which was so nice, probably one of the best I have had from a hotel. The next morning we arose feeling extremely relaxed and refreshed. We both agreed that it was the best nights sleep we had in a long time. 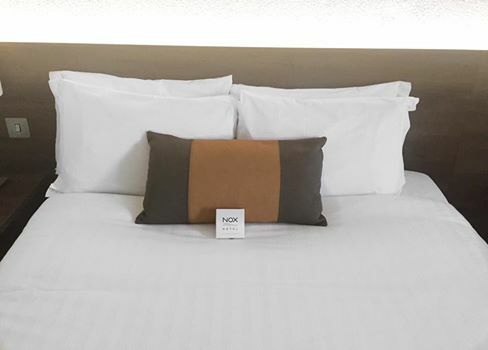 The hotel prides themselves as specializing in superior beds with cozy duvets. After we finished getting ready we went downstairs to the restaurant. It was a buffet breakfast which consisted of fresh orange juice, infused water, herbal teas, tea, coffee, full Irish breakfast, croissants and pancakes. I choose pancakes of course which were made with the hotels very own pancake machine. Check out was at noon. So after we sadly packed our belongs we made our way downstairs to the hotel lobby. We spent an hour or so chatting and exploring the hotel before going for lunch in the hotel restaurant. Again there was so much choice on the lunch menu. 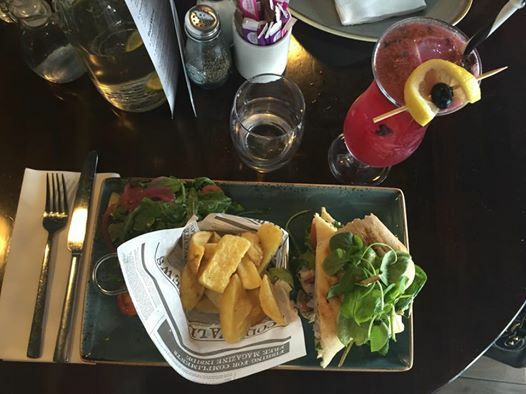 I decided to try the Club Sandwich which consisted of grilled chicken, lettuce, tomato and mayonnaise served on ciabatta bread with a side portion of chips and salad. It was delicious. We were then served Blueberry Mocktails which were so nice and very refreshing. We then went on to have dessert. We both decided on cheese cake. I opted for strawberry while Shona opted for lemon. It was just before this that the announcement had been made that Galway was now Europe's Capital Of Culture. You can just imagine the excitement. Everyone was so excited and filled with joy. The chef was also thrilled with the results and decorated our cheesecakes by writing Galway 2020 in Nutella. 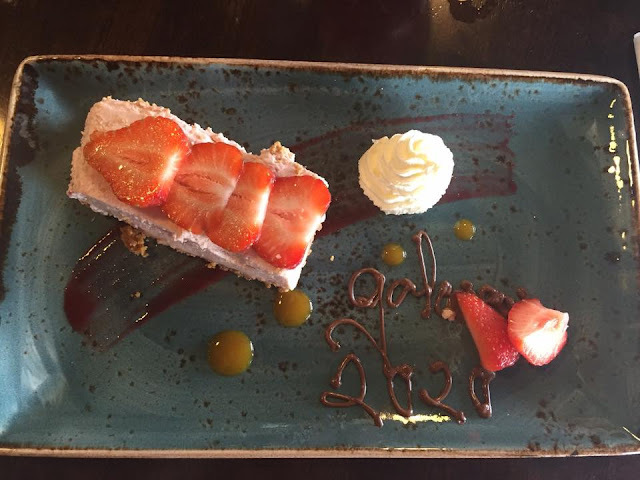 The cheese cakes were light as air and so refreshing for after a meal. 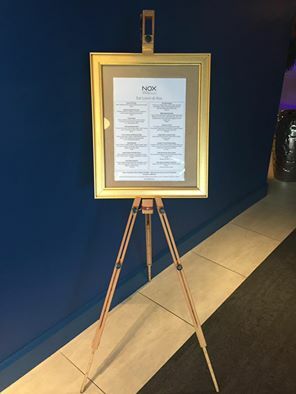 The staff at The Nox Hotel were amazing, friendly, kind, helpful and willing to go out of their way to make sure you enjoyed every minute of your stay. A huge Thank You must be given to the amazing team for providing us with such a pleasant experience. I will definitely be visiting again soon. 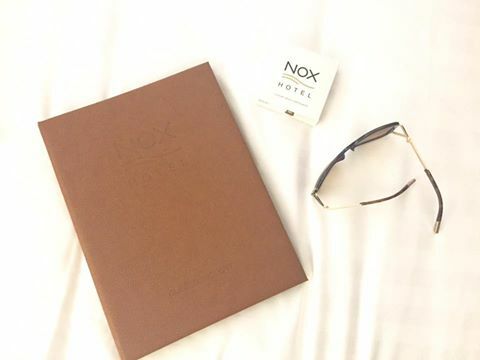 *This post is in collaboration with The Nox Hotel but all opinions are my own.